We are pleased to announce the publication of a new article that demonstrates the effectiveness of a nationwide climate change education program focused on high schools. 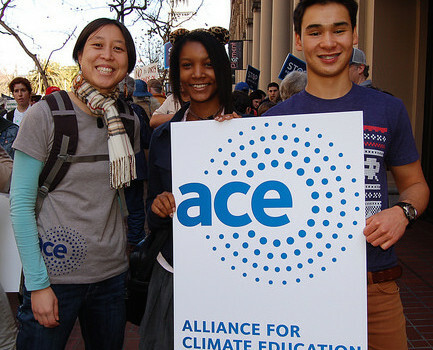 The Alliance for Climate Education (ACE) is a non-profit organization that conducts climate change education programs in high schools across the country. Yale, George Mason University, and Stanford researchers collaborated with ACE to evaluate the effectiveness of its assembly education program. The exciting results of that evaluation were published this week. In short, students who participated in ACE assembly programs became more knowledgeable about and engaged in the issue of climate change, and changed their communication and conservation behavior in a number of important ways. We encourage you to learn more about ACE and to download the article, which is open-access (free). Flora, J., Saphir, M., Lappe, M., Roser-Renouf, C., Maibach, E. & Leiserowitz, A. (2014) Evaluation of a national high school education program: The Alliance for Climate Education. Climatic Change. DOI 10.1007/s10584-014-1274-1.